Is there a place you like to go that makes you happy? I was blessed to be able to go to that place this last weekend. You know those times…when so many things get put on your plate, and you need that “away” time to gather your thoughts again? My husband and I planned on getting away to celebrate his recent retirement. We were blessed with an opportunity to enjoy a wonderful home on the ocean! My favorite place to be! But even more than that, we were also blessed with favor! Come along on another journey… this time… to the ocean! My heart swells at one of the lessons that came to me this last weekend. 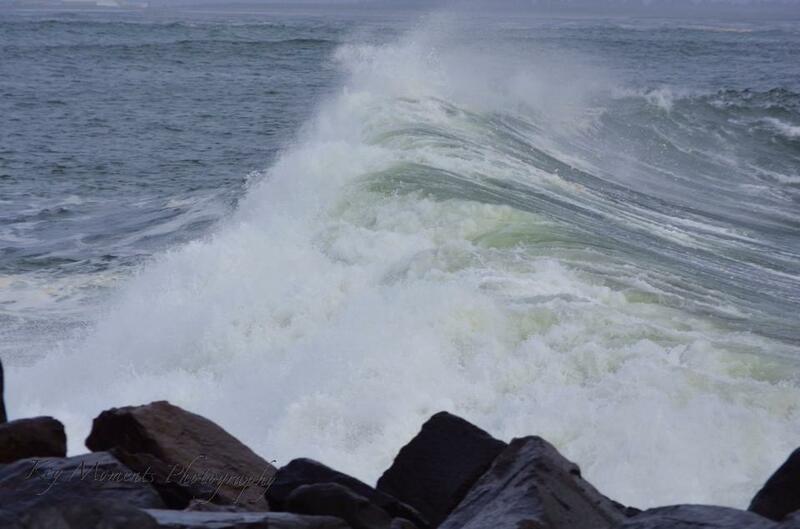 As I watched the force of the currents coming together in HUGE waves out at the Jetty, I witnessed the power the waves gained as one wave pushed into another wave, and then another wave. The waves would build and build, until it came crashing into the shore or rocks. We can have things like that happen in our lives that is a lot like that also. We can have “Murphy’s Law hit us, where anything that CAN go wrong DOES. We can have loss of our home, finances, family falling apart, marriage hardships, or the loss of a loved one. 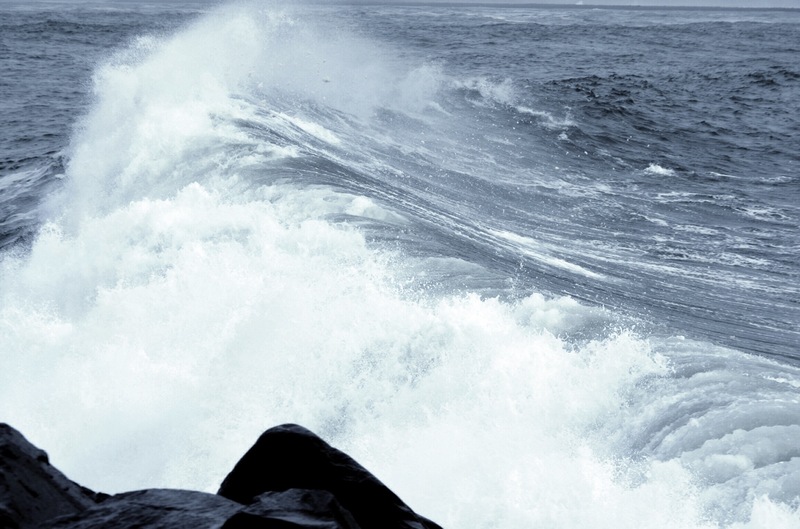 There are a number of situations that can build up like waves that overwhelm us. As those waves build on each other, we can find ourselves headed with great momentum, and crashing against the rocks of our lives with such force that we are feel like we are coming apart. My strength in these times comes from my relationship with Jesus. I gain strength from steadfast faith and a persevering spirit. I don’t give up! My foundation is not built on the sand, but on the Rock! I can be a OverComer. He will even make good come from the hard times! If we allow that, we can rise above those stormy seas of life! Under tows in the waves are a dangerous thing. They roll us right under and pull us down. I don’t want to get sucked down by the powerful under tow, or the weight of life situations. God gives the strength for us to continue in faith; it comes from within and is placed there by God. He is the Source. As we live that way, we can see the favor of God in our lives. Let me share some of God’s favor that happened to us this weekend. 1. A couple blessed us with their home for the weekend! LOVED it. 2. Due to an error made by the person who changed our oil last, we found we had lost ALL the oil in our car. Not one drop showing on the stick! Aberdeen Ford Dealership, you rock!! They took it in 20 minutes before closing, fixed the problem, cleaned it up, filled it with oil and ready for this???? FREE! It was cool too because that is where we originally bought the car from! 3. We had dinner at Billy’s in Aberdeen on Easter evening, and Terry and I wanted to split a piece of cheese cake. The waitress gave it to us on the house! 4. Our weather for the most part, was wonderful! So, that meant that I could get out and walk the beach with my sweetheart and enjoy getting some shots with my camera. 5. We had some time to hit a few thrift stores, got some good finds, one of which was a grab bag Terry found and it had some great stuff in it! I think it makes God happy to give to us, so it is important for us to recognize where it comes from! My husband and I have certainly have experienced God’s love through the way He provides for us, and we are thankful. Notice things and look for God’s hand in our everyday = He shows Himself faithful to bless us! I love living life that way. It’s living life in a different light. It gives perspective in how I live. We had fun talking and sharing what retirement meant to both of us. We asked ourselves questions such as, “What did we see God doing in our life? What is His future for us? What dreams did we have that we can support each other in?” So…we sat sipping a mocha and coffee, watching the change of weather in the sky, and took the time to share those things with each other. Just like the waves that are beautiful to watch, I need to remember that they are powerful too! I can easily get pulled in, and then under. But, I have a God Who has an arm that is never too short to save me. Never to busy to bless me. I am thankful for that! There is one more special things that has happened to me. At least four different times in the last few weeks, I have had an eagle soar over my head in a circle or two, and then fly away. I don’t know what that means, but I noticed it! I felt God telling me I am free, and I thanked Him for it. I don’t think those things are random. They are a message to be noticed. 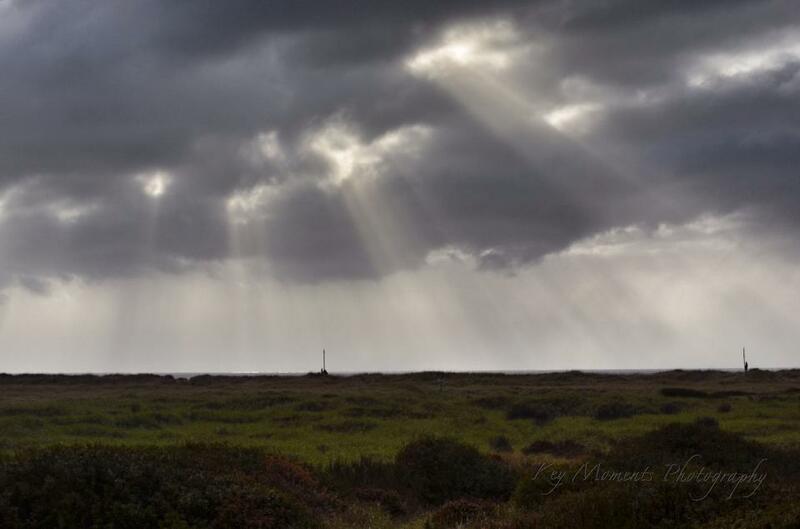 As we sat and enjoyed the view out the big windows, He gave this beautiful example of His light shining through the darkness, and it was yet another grace moment. Great lessons at the beach last weekend. That is my space to hear God speak. But, He can speak to us anywhere if we take the time to quiet our spirit, lean in, and listen. One more lesson I learned this past weekend: It might not be so wise to climb up on the rocks for picture-taking when you can’t step the same length of steps going down! I climbed up… not a problem. Going down was a total different story! It required a great guy to come to my rescue to help me down! Sometimes, we need to accept the help. We don’t need to do it on our own. So… as you enjoy the photos, I hope they speak to you and cause you to take pause and ask, “Where do I feel like life is power rolling over me, pressing me down, and/or sucking me under?” Ask the hard questions. You might be surprised at what you discover! I am always amazed at His object lessons! Thanks for sharing your thoughts Cindy! It is what this blog is all about! It is certainly not about me, but what I feel God puts on my heart to share and how I experience it. I pray that when your family member reads this post, he/she will find a source of encouragement. Thanks for the heads up on the song. I will have to go find it! And yes…we are sisters in Christ! Blessings! Look for God’s hand in the every day…yep! Good word!